One well-used piecemeal Raleigh XXIX+G steel 29er; one dusty proto 29+ frame with well-used tires; one day of madness making things work that ain’t supposed to work– one handsome mess. We’ll talk some more tomorrow. Thanks to Cass for the frame– it fits me just fine. Thanks to Charlie for letting me make a mess at Two Wheel Drive in ABQ. Thanks to Rusty for a week of consultation, of the most obscure kind– it isn’t easy to fit big tires and a wide range of gears onto a bike, for less than $30. We successfully turned a load of used parts into a 29+ touring shredder. Thanks all! Inches of rain in Arizona are undoubtedly good for a state in perpetual drought, which is the exact nature of a desert as I understand, For us, aside from cold fingers and toes, this means the possibility of sticky, muddy roads and trails. We’ve enjoyed the length of the Black Canyon Trail, tasting temperatures below 2000ft in elevation. It was nice to be back in shorts and t-shirts for a few days, but our focus on the AZT brings us back to Flagstaff, nearing 7,000ft. A chance of snow, amidst a 100% chance of rain for several days has sent us looking for something else. The solution is to hitch to Albuquerque for the weekend to visit friends. We lived in ABQ last winter for six months, and would hate to let another year or two pass before making contact in New Mexico again. By that time, contacts will be lost, and it all fades in memory. While traveling, we make an effort to visit as many friends and family as possible. It is a lot of fun, but it can also be a lot of work. In total, it is worth it. These are, after all the effort, lasting friendships. More on the Black Canyon Trail soon. Thanks to Lil for picking us up at the south end of the BCT, and transporting us back north. What luck, that also included a genuine Mongolian yurt for the night, out of the rain; a hot shower, laundry, and even a hot tub. After coffee in the morning, and conversation, we peeled ourselves away to make our way east, along the I-40 corridor, which has mostly grown over historic Route 66, but not entirely. As such, we’re standing on a corner in Winslow, Arizona, a line made famous by the Eagles song “Take it Easy”. We’d be lucky if a girl in a flatbed Ford would slow down to pick us up. Until now, it has been a bit grim, standing in passing rainshowers. Hitchhiking is not our preferred mode of transport– it is far form the freedom of being under our own power– and there is an Amtrak train between Flagstaff and Albuquerque, but hitching often makes sense for our impromptu decisions, and for our budget. This is our first time hitching an interstate highway corridor. I’ll take my luck on backroads any day. The interstate is depressing. Thanks to the truck full of Navajo construction workers who got us out of Flagstaff. Those guys understand. ABQ!– Burqueños, be ready. We hope to be in town sometime today (Friday). I hope to arrange some gatherings over the weekend. A ride in the Rio Grande Bosque, a Ukrainian feast, a fresh salad at Vinaigrette, or a pint at La Cumbre? Anyone in ABQ? By now, we’re off on the Black Canyon Trail, a recently refurbished, reimagined, 79 mile multi-use trail through central Arizona, running along the foothills of the Bradshaw Mountains, through a corridor from the northern Arizona grasslands down to the prickly Sonoran desert. Leaving Flagstaff for the last time, we shoot for the northern terminus of the trail, near a little town called Mayer. Between here and there is a whole big slice of northern Arizona. From Sedonan spirituality, to public service signage in Mayer that reads, “There’s life after meth.”, this chunk of rural country has it all. While we’re here for the AZT and the BCT, amongst other routes and trails, sometimes it is the roads between that capture our attention most. Above: The last bit of the Lime Kiln Trail, connecting Sedona to Cottonwood, AZ. Mingus Mountain looms in the background, under stirring skies. 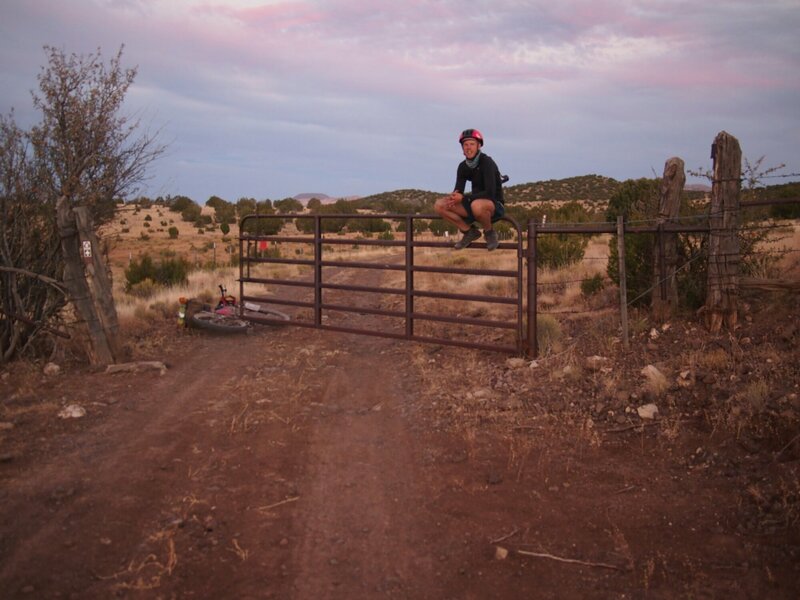 Below: Riding from Flagstaff back to Sedona– this, our second time– we descend Schnebly Hill. I could make this ride a hundred more times without losing interest. By the time we near town, we stop for some of Arizona’s best. For another few days, we make loops around town. From our preferred grocery in town, it’s a quick five minute ride back onto trails, connecting with the Ridge Trail down to the gravelly beach along Oak Creek. Across the Chavez Ranch, to Oak Creek. We wade across the creek at sunset on this night. To ride the Templeton Trail– again, a third or fifth time– in the dark. To a camp spot scouted on a previous ride, on a hilltop near the intersection of Slim Shadey and Templeton. Towards the Village of Oak Creek, the blue-collar town south of Sedona, home to the IGA, $49 motel rooms, and a scattering of outlet shops. A second broken Salsa Anything Cage in one summer means it is time for another solution. I’ll miss the 64 oz. bottle. New shoes for Lael. Which look better? She has nearly worn holes through the packable Merrels that she has been using all summer. Rocky trails hurt her feet through thin soles. Let’s go shopping for discount kicks at the Famous Footwear! Historically, Alaskans would always go shopping when “going outside”, to pick up brands unavailable up north. Alaskans love Arizona. Then, meet and ride with another Alaskan— a transplant like the rest of them– on a loop including Templeton and Llama, two of my favorite trails in Sedona. By evening, time to navigate out of Sedona. 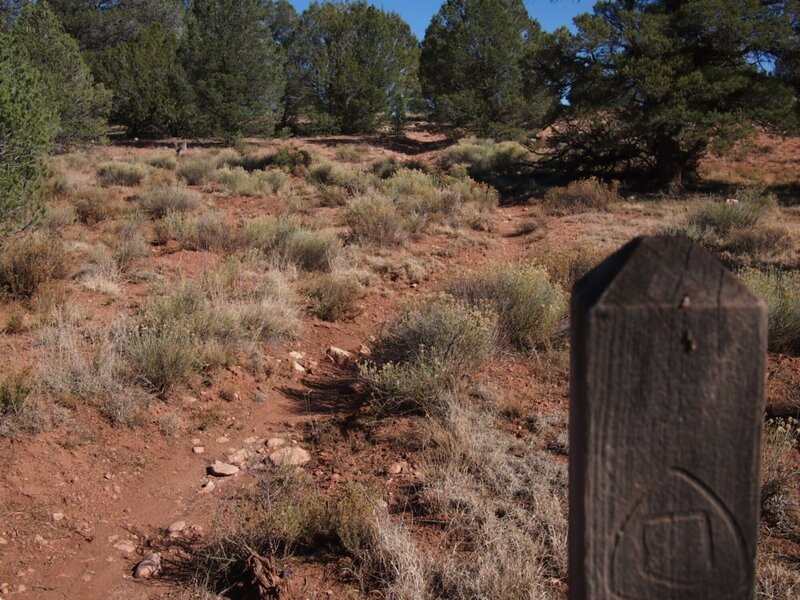 Onto the Lime Kiln Trail, which is included as part of the Coconino Loop route. It is a bit prickly out of Sedona, crossing Highway 89, but the trail quality picks up steam towards Cottonwood. A rainy night in Arizona. Part of the reason we’ve chosen to squeeze the BCT into these few days is to avoid some weather coming through. Back to the AZT after the BCT. Into a diverse blue-collar town at the junction of the Verde Valley, and the mountains above. A fat sack of Mexican pastries for the climb. Good tortillas and a panaderia are perks of visiting working communities in the southwest. From the Coconino Loop route info, we choose the bypass route around Mingus Mountain, avoiding a hike-a-bike over the top. On a blustery rainy day, the top of the mountain looks uninviting. The sun suggests we have made the right choice. Since leaving Sedona, I haven’t slept a night without the sound of gunshots nearby. Arizonans love their guns. Thankfully, the roads are not not too tacky, with the help of pine needles and gravel. Descending the backside of Mingus, towards the pavement. The paved pass over the mountains, an alternate route from Cottonwood through Jerome, is seen in the distance. Down to the Prescott Valley, where the sun is shining. Freshly constructed Bible churches are bursting at the seams on this beautiful Sunday morning in the valley. Prescott Valley is a rapidly growing community, largely due to cheap land. Houses are seemingly glued together; many are currently for sale, yet the area is growing. The next Phoenix? Gas station coffee. Lots of big pick-up trucks. Some agriculture is left in the area. Cattle graze the remnants of the Halloween harvest. A new bottle and cage under the down tube, and a once daily ‘clean and lube’. A bit after noon, it’s beer :30, en route to the BCT trailhead. For this stretch, we stick to the pavement. One of the routes we had planned was signed as a private road, with a locked gate. Thus, the detour into the city of Prescott Valley, and down through Dewey-Humboldt. There are better ways to connect Mingus Mountain with Mayer, off-pavement. Into the town of Mayer. Which hosts a failing local grocery, a Family Dollar, and a Circle K gas station. Between these stores, you can buy canned foods and chips at three places. We found a fine assortment of food for a day on the trail, including a few apples. Just off the side of paved Highway 69, between the halves of Mayer (several miles apart), we spot a sign for the BCT. I know it goes under the road, but the trail is hard to spot. A gravel parking area, to serve as a future trailhead, is nearby, but gated and locked. A newer cattle gate is a good sign. And a pile of rocks suggests some well-meaning trail volunteers. 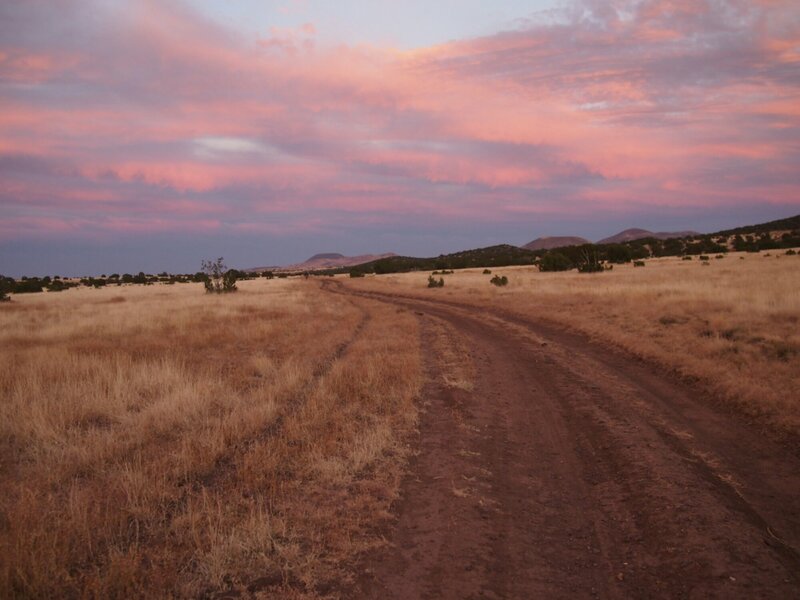 It leads to a beautiful ribbon of trail over the hill, and off into an Arizonan dreamscape. Should be a great ride! Back in a few days, when we’ll shoot back north to connect with the AZT near Mormom Lake. A few weeks ago, I added a page to the site titled “Contact me!“. Already, I’ve enjoyed correspondence with several people, including an acquaintance and host from the San Luis Obispo Bike Kitchen, and the current owner of the purple Surly Pugsley that I rode for a year and a half, including a six month tour from Alaska to New Mexico. I purchased the Raleigh XXIX that I am currently riding less than a week before leaving New Mexico this spring. As such, I was unable to sell the Pugsley in that time via Craigslist, and left it with Two Wheel Drive bike shop, where I worked part time. I never knew what kind of home the bike found, until last week. The following are excepts from email conversations with Eric. Greetings from Boston, MA! My name is Eric and I am the proud owner of your old Pugsley. I bought it from a man who came from New Mexico and sold it to upgrade to a Ti fatbike. I had known about your blog for a bit but had no idea that responding to a pictureless craigslist post would present me with such a find! I have just completed my first (of hopefully many) bikepacking overnighters. During my trip, I found problems using a rack and having the weight throw me off in turns. I am now interested in buying the Revelate/Surly framebag to keep the weight lower, and wondered how it fit. You said in one of your posts that the bag did not fit perfect. What were your notes on the bag for the Pugsley? I wondered if it was a problem while traveling or would you advise towards a different bag. Please let me know and thank you for being a great resource and inspiration in bikepacking. What great fortune to hear about the old Pugs! I left the bike at Two Wheel Drive bike shop the week before I departed for Europe this past summer. I worked at TWD part-time and Charlie offered to sell the bike for me if I didn’t get rid of it before leaving town. Thus, I never knew where the bike went, although I hoped it would find a good home. I know it is a well used machine, but I guarantee it is much, much more functional than when I first bought it in Seattle in the winter of 2011. I picked it up for $1250 on a week-long layover in Seattle/Tacoma before flying to Alaska for the first time. I eventually discovered rusty and maladjusted bearings, handlebars too narrow for my preference, and the ‘spare’ tire that wouldn’t seat to the rim due to damage (most likely from an overzealous tire lever operator). By the time I was done with it a year later, nearly the only original part from my purchase was the frame! (some changes made for personal preference). I will be flying back to AK this December, and hope to be riding another fatbike before the new year. I am hoping to do things a little differently this time. When I purchased the framebag directly from Eric (Revelate) in Anchorage, he was short on stock, and I selected to use a size Medium framebag on the older Medium frame. As you may have learned, the Pugsley frame design changed a few years ago, when the new triangulated section near the seat tube was added, lessening the space within the main triangle. As such, the current offering of framebags does not fit the older frames exactly, however, a Large size Revelate framebag should readily fit your Medium Pugsley. Actually, the older frames offer more framebag space than newer frames– just buy ‘up’ a size on stock Revelate bags for an older Pugs. The Large bag should fit nicely, and will help stabilize the ride compared to what you describe. If you’re going for a completely rack-less setup– or even a rock-lite system– don’t hesitate trying out various dry bags and straps before putting down money for all the proper bikepacking kit available. The ‘real’ stuff is top notch, although it is not always completely necessary. I’ve wandered through a slew of home-brew bikepacking methods before landing on something that works for me. At present, I have a lot more capacity than most bikepacking systems (for the computer, and luxuries of food and water). Still, the bike rides nicely, maintains a narrow profile, and comes in lighter than the average rack and pannier system. 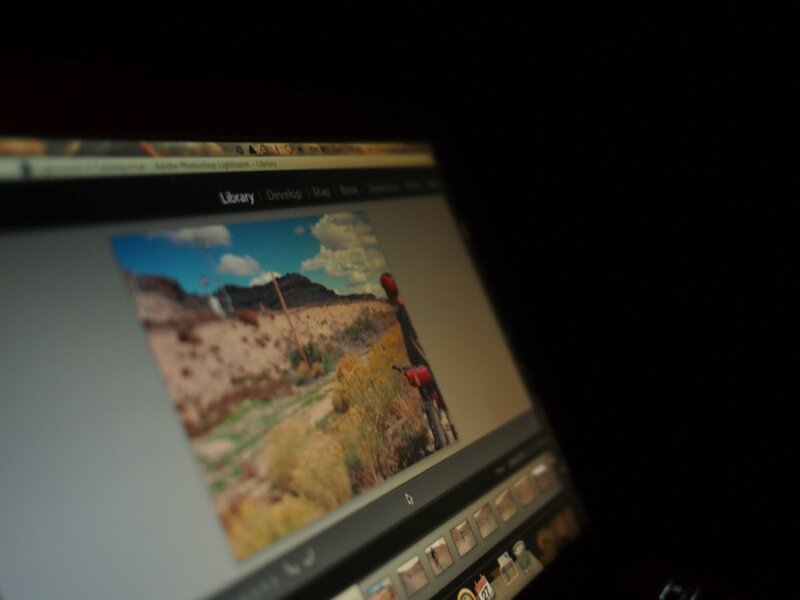 Do you have any photos of your overnight trip? I’d be happy to share a few photos on the blog, along with some of our correspondence. I think lots of readers will find it interesting to follow the infamous purple Pugs. I find that conversations like these can be enlightening to others. I hope you continue to enjoy the bike! Thanks for the quick response. I will most certainly go with the large bag then! I’m excited. I have my next overnighter scheduled in two weeks where a fellow mechanic and I will ride fatbikes down the North South trail in Rhode Island. It doesn’t seem like there is are as many long distance trails here in New England, but again I am new to searching for them. Hopefully they will make themselves more apparent as time goes by. I have had the bike for just about 2 months now and it still maintains about the same set-up that you left it with, but soon overhauls will need to be done. I am originally from North Carolina and moved here to Boston about 4 years ago on a whim to escape the clutches of suburban desk jobs. I ended up finding a home in a non-profit named Bikes Not Bombs, which provided a cycling community and taught me the skills to work on bicycles. I am now a full-time mechanic. For the first overnight, I started from home, cut across to Borderland State Park in Easton, MA and down to Dighton, MA through the power lines for the night. On my first night, I found out my gear is not nearly as warm as I had expected :). The next morning I headed down towards Bristol, RI and rode up the East Bay Bike Path and continued up the Blackstone River Path back into MA. Not as much off-road riding as I would like but I am looking forward to more great rides! Long distance on the roads is tough with the Pugs but off-road it is like butter! I covered about 110 miles on my overnight. Please let me know if you know of any good rides in this area. I am itching for more continuous dirt roads. I will take good care of her and feel free to drop by and take her for a spin if you are in town. Does anyone have any suggestions for mixed-terrain or off-pavement routes near Boston, MA, or within range of the city via public transit? Note, fat tires don’t play well with bicycle racks on many buses, but something like the Amtrak Downeaster works. Help an urbanite out of the city! Two years of travel without electronics, save for some old-fashioned cell phones, is now a jealous memory. Our first two years by bike are entirely undocumented, except for the stories we tell and a few photos that may exist, taken by others. That is the way lives and experiences were memorialized for many decades, compiled in a meager photo album, or told as a story around the campfire. 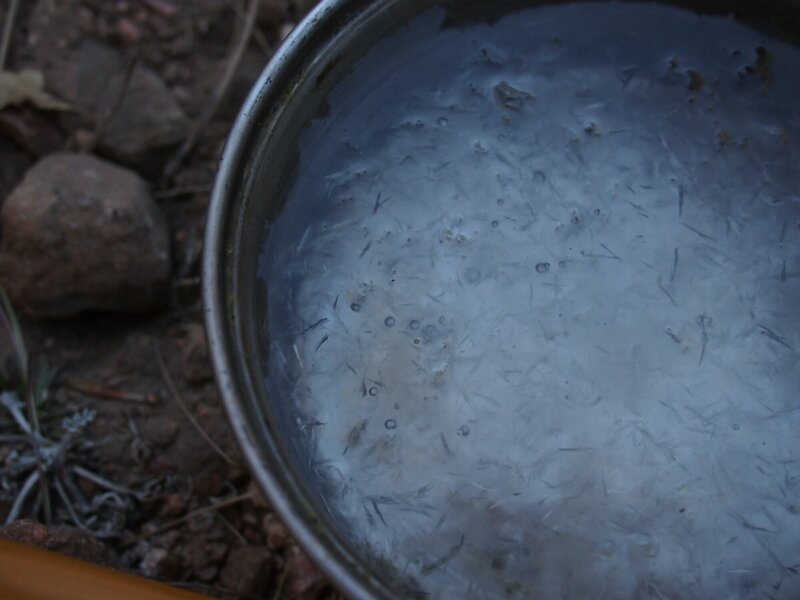 On our first night south of the Grand Canyon on the AZT, a two liter bladder of water burst inside my saddlebag, dousing a small bag of clothing, my cookpot, and my computer. The saturated laptop quietly whined all night, like the sound of a slowly deflating sleeping pad, but which is actually the sound of a dying battery. I kept the computer in my sleeping bag to keep it from freezing, and I sunned it in dry Arizonan afternoons over the next few days. It has yet to be seen by a professional, but the prognosis is not good. I remind myself that we are happy, healthy, and much too lucky in all other respects. Although inaudible, my sleeping pad is also losing air, again. Until I can repair or replace it, I will enjoy more room for avocados, a half-dozen pounds less in my pack; more time for sitting in the shade, thinking; and a little bit more fun exploring Arizona, without a computer on my bike. I am already wondering if I can squeeze into a smaller seatpack like Lael– she just seems to be having so much fun. For the next few weeks, I’ll be on vacation from the internet, mostly. If you want to know what’s happening, you’ll have saddle up and join us around the campfire. The ride leaves tomorrow morning from Flagstaff. I will make an effort to share words and images as it is convenient, mostly as a way to test the possibility of staying connected with a lightweight packable tablet, and a camera. This post was written entirely on a Google Nexus 7 tablet. All photos by Lael Wilcox, from her miniature Olympus E-PM1 camera with Panasonic 20mm F1.7 lens. The import process requires an OTG cable, USB SD card reader, and the Nexus Media Importer program. Any suggestions for simple Android-based photo editing programs?